Here is the solution for auto Login in Windows-7 without entering a password! For an auto login in Windows-7 without password, please start the cmd.exe in administrative mode! See the Windows-7 FAQ-23: ... Start the Windows 7 cmd.exe in administrator mode! In the cmd.exe, execute "control userpasswords2" (execute= Press [ENTER]) (see Image-1). Please select the Use for Autologin in Windows-7! "Users has to enter a user name and password to use this computer"
press Ctrl-Alt-Del and select Change Password. Use the list below to grant or deny users access to your computer and to change passwords and other settings. Windows-7 - FAQ-24: Auto login without password on Windows 7 (How to)? Use the list below to grant or deny access to your computer window, password windows 7 64 bit cmd.exe? How to logiin withoout password administrator, windows 7 home premium autologin? How to find a windows 7 logon password in cmd, enable administrator autologon in win? How to open cmd without logging in, remove windows 7 auto login password? Automatic logging, windows 7 auto login with password? Windows home premium 7 password, how to open windows without a password? How to use cmd without logging in, windows 7 forgot password ctrl alt delete? How to log to win7 without pass? How to login to windows 7 home premium without a password? How to log on to windows7 without a password, access cmd without logging in windows 7? How to login to window without password? Autologin win7 home premium, windows7 login without password? Access windows without password windows 7, log into windows 7 without password? Login to windows starter without password, ctrl alt del to login as administrator windows 7? How to login without password in win7, windows 7 logon without password? Remove windows vista home premium login password no download? How to access windows without password? User-Login in Windows-7 without Password? How to select a User in Windows-7 for Auto-Login? Autologon windows 7 64bits, windows 7 home premium auto login? How to open windows 7 without password, how to login as administrator in windows 7 home premium? Log in without password windows 7 cmd? Auto login win7 without user name or password? How to login without password in windows 7? Cmd autologon, windows 7 starter can i open without password? How can i open a computer without the password windows 7? Open pass win 7, start win 7 home premium without password? How to turn off password on windows 7 startup? Default password for administrator for windows 7 home basic? Windows 7 select no password at login? Auto Login to Windows Without Entering Password? Windows 7 execute no password? Windows logon without password win 7? 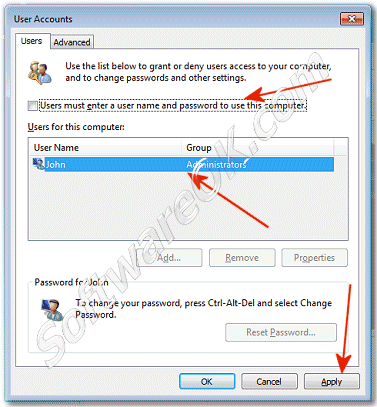 How to select automatic login in windows 7? Automatic select user to logon windows 7? Autologon in win-7 without CTRL-ALT-DEL? How to log on windows 7 starter without password? how to login without entering username and password? How to login windows 7 starter without password? How can i open a computer without the password of win7? Simple startup without logon needed in win 7? How to disable startup login for windows 7? How to login windows computer without password, how to access computer without password windows 7? Remove your password option windows 7 home premium 64-bit, login without login control alt? How to disable a user account in windows 7 home premium 64 bit, windows 7 x64 autologin user? How to login without password in win7, how to logging without password in win7 home premium? Win7 home premium automatic login, how to login without password windows 7? Windows 7 home premium how to remove sign on password and Window7 64 bit autologon? Windows 7 login without password auto eg. how to remove starter logon in windows 7? How to remove user password om window 7 starter and how to open windows seven woyhout password? How to login without administrator password windows 7 home premium? How to remote login password windows 7, windows 7 home premium auto logon? Windows 7 login no keyboard, how to open cmd without logging in windows 7? Login without password cmd, windows 7 autologin? Use the list below to grant or deny access to your computer? Log on Automatically to Windows 7 Without Password? How do i make a user autologin on windows 7 64bit? Windows 7 home premium automatic login? Windows login cmd passwd acces 2, username windows 7 starter? How to get into windows 7 starter without password? How to logon adminitrtor with out parssword? Windows 7 home premium automaticall logon combine user and administrator? How to login to win7 without password, removing windows login password in windows 7 starter? How to disable logon password for windows 64 bit startup, win7 home premium autologon? Is it possible to log into windows 7 profess without a password and Autoadminlogon windows 7 disable ctrl alt del? How to login administrator in windows 7 without password, open windows without entering password win7 software? Disable password on startup for windows 7 ultimate 64bit and win 7 home premium automatic logon? Which file to delete to login without password in windows 7, login to windows automatically without password? Use windows 7 without password? Autologon windows7 cmd, windows 7 no password on startup? Auto login windows 7 home premium, auto login no password? Log in without password windows 7? Set auto logon with cmd win 7? Auto win7 login without user name or password? Automatic password change in win 7? Windows 7 64 automatic login? Windows automatic login without password? How t change picture in entering window 7? How change windows 7 password without keyboard? How to access windows 7 without password? How to login without password in windows 7, auto logon windows 7 home premium? Windows 7 home premium automatic login, autologin seven? Windows 7 auto logon without password? Auto logon windows 7 home premium? Windows 7 home premium auto login? How To Automatically Logon To Windows Vista cmd?